Porter Airline trip Photos: Monique Simone Photography & my own travel shots! On June 23rd I took off with Porter Airlines to visit Chicago, Illinois. If you did not already have the chance to see, you can check out my earlier post where I discussed what travel influencers really have become. We are helping you shape your destinations, discoveries and adventures and asked all of you to help curate my trip to Chicago. I shared a few questions and received tons of responses on social media (thank you!). Porter and I asked our followers on Facebook, Instagram and the blog to help create a trip that would really showcase what YOU wanted to see. From this, I created the perfect itinerary for my 3 days in Chicago. Brace yourself, it was action packed! As you scroll through this blog post you will see plenty of amazing things I did during my time in Chicago. Some photos, some comments and great eats! I will share with you all a photo diary later of all the awesome spots in more detail during my stay. The end goal has been to really share how INCREDIBLE Chicago is as a city. I also want to share how easy it is to get there via Porter from Montreal or Toronto. I've visited in the past, sharing this incredible city with you all, full of life, art, business, culture, food and FUN. People are always asking me why I fell so in love with this city and continue to go back time and time again. From the food and cocktail wizardry of chefs like Grant Achatz, to art and design like the famous BEAN by Anish Kapoor in Millennium Park, the city is full of culture and stories and really really nice people. I emphasize the nice people because over my time in Chicago I have met some amazing humans. They have helped me make great connections and have wonderful experiences. I stay in contact with them on a regular basis and am so thankful! This time, Porter Airlines gave me the opportunity to return and experience it like never before. Porter stole my heart some time ago and continues to do so over and over again (which is why I love to work with them!!). The staff is incredible, the service is great, the lounge and planes are beyond accommodating. Of course the added bonuses like coffee and snacks are just the icing on it all. I am so fortunate to work with this airline. In three days I really covered as much as I could for all of you to see, hear, watch, read about. I have so many more stories and suggestions that I can't possibly all share here. Please do not hesitate to reach out with more questions. I would be so happy to answer anything about this incredible city for those who would like more detail. Before I share it below, keep in mind I was trying to cover as much as possible for all of you to see. Tackling everything in one trip may not be possible for everything. But that's why okay, since Porter flies from Billy Bishop Toronto City Airport to Midway International Airport multiple times a day! Take this itinerary with you when you fly Porter to Chicago on your next long weekend getaway and I hope I helped you discover something that makes you smile :) Enjoy! Hung out in the Porter lounge and checked out the cockpit of our plane! Walked Millennium Park exploring The Bean, the new outdoor concert venue and Crown fountain! Headed to the Riverwalk, heard live music and sipped wine at Bridgehouse! Walked Michigan Avenue, munched on donuts from Glazed and Infused. Explored West Loop spots like Green Street Smoked Meats, Expat, RM Champagne, Soho House and Bombobar! Spa visit at Fairmont Chicago's incredible Spa! Headed up to Lincoln Park for Dinner at Summer House Santa Monica, Kareoke and late night snack at Taco Join! Brunch at the Fairmont Gold lounge before my flight back to Toronto from Chicago! If you're looking for a hot spot hotel in the center of all the Dallas action, a few minutes away from both downtown and uptown, the W Dallas Victory hotel is the perfect spot to stay. This hotel is known for its hot spot bar, restaurant and of course lounging poolside in the middle of the city. The W strives to be very involved in the community from city to city. There is no exception here, as the W Dallas is heavily involved in plenty of community creative events and animations in the city. Steps away from the art district, the W Dallas shares this art throughout the hotel. They make sure to highlight the amazing collaborations and spots they love in the city on W Dallas Insider tour hosted by their lovely insider Frank Evert. Check it out here. The hotel restaurant brings guests the famous TexMex inspired dishes from the south. They also have an array of more traditional dishes as people travel. The design is amazing inside and invites guests to lounge around a little longer than meal time. The best dish on the menu, their Gnocchi topped with oyster mushrooms and parmesan. See the full menu here. The restaurant also offers a complimentary coffee bar in the morning. We all know this stole my heart. The Living Room bar caters to both guests and locals as place to grab a drink and mingle. While staying in the city I heard plenty of people chatting about the W Hotel Living Room Bar as a fun spot to check out. Of course staying at the hotel I had the pleasure of doing so. This spot is open and lively. Has great music, a nice wine and cocktail selection, and of course beautifully designed in the spirit of W Hotels. The fun part is that the Living Room vibe is completely different from that of the Cook Hall. Both equally spots to check out. The W Hotel is known for having outstanding suites and the W Dallas Victory steps up their Texas game. This location brings the best of the W with outstanding views, spectacular design and beautiful products offered along your stay. The bathroom was one of my favourite parts, with an open concept to the bedroom, plenty of mirrors, great lighting and a spectacular shower. The room design is far from basic showcasing both W signature style and that of the local trendy Texans with cow print and leather touches. I cannot speak about this location without mentioning the spectacular rooftop pool overlooking the city. The WET pool at the W Dallas welcomes guests all year round. In the middle of beautiful January this infinity pool was open for business. It is attached to the Bliss Spa offering services from facials to nail care, all valuable while traveling. It is also next to the Fitness center where you can successfully recharge and sweat it out on your stay (before or after pool side lounging). One of my favourite aspects to the W Hotel is that they always seem to be spots you never want to leave. 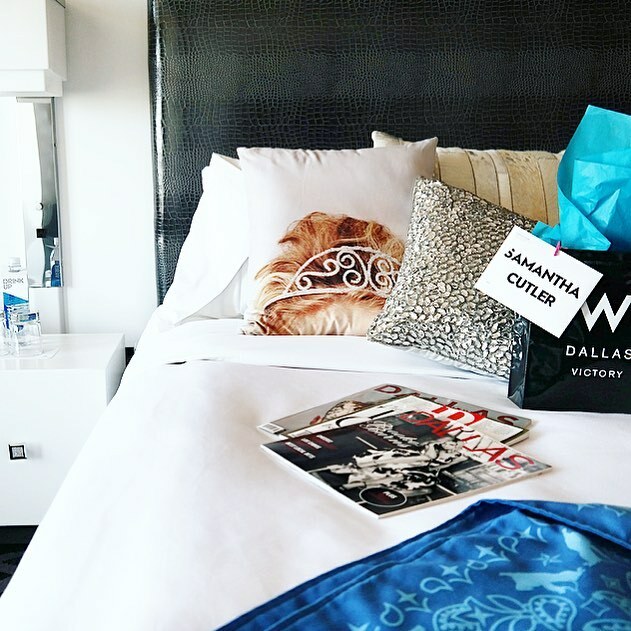 Of course I do, and head out and explore the city, but if you live in Dallas and are looking for a staycation or a mini getaway, the W caters to you. Brunch is the ultimate meal, especially on a Sunday like today. When traveling, finding an incredible brunch is like hitting the jackpot. You actually have time to sit around and enjoy, grab a mimosa, eggs benedict, make some friends and get to know a city. I've shared tons of brunch spots with you all as I travel, but here is one from my home city. Whether a local, or just passing through, this foodie experience is one to live out (and delicious from start to finish!) Conveniently located in one of the best situated hotels, The W Montreal most recently launched their newest restaurant called E.A.T. on the cusp of Old Montreal and seconds from buzzing griffintown and downtown areas, right in front of Square Victoria metro and of course moments from plenty of great land marks, there is no excuse not to start your day with brunch here. E.A.T has successfully created an experience for brunchers. For this reason, you will find both locals and tourist trying out this new spot... and for hours. Expect to show up around 2pm and the spot will still be backed with a great ambiance and energy, a key part to your brunch. The experience begins from the moment you walk in, with graffiti and pop art covering the walls throughout the restaurant from a number of renown Montreal artist. Of course the W Montreal is known for its great salute to the city, and E.A.T is no exception. The windows are stamped with the symbol of the city of Montreal and the tables are covered in cartoons of historic landmarks. Even our Mayor, Denis Coderre, gets a caricature shoot out. You begin your brunch with a mimosa cart that comes to your table. Fresh blueberry, strawberry and mango puree can be mixed in with champagne and berries, but the personalization of the process is what captures everyone's eye (and cameras.... getting E.A.T plenty of images on social). They also have a pastry cart that arrives to your table with a selection of croissants, chocolatines, danishes, muffins and more. The presentation and the options capture the best there is in brunch. The same way ordering at a bakery excites us, they were able to bring this feeling here. And finally of course, the menu is packed with outstanding options. My personal favourite is the lobster benedict. The presentation on the dish is out of this world. The entire lobster comes to the table, along with an open faced English muffin, fresh lobster meat, egg and their own version of a hollandaise sauce that is much lighter and more complimentary to the lobster. If you are a local, a visitor or a foodie of any kind, make your way to E.A.T at the W for brunch. You will not regret a thing you order, and you will enjoy every moment of the experience as you lounge around in the airy open space that will be sure to capture your visual senses. Valentine's Day happens to fall on a sunday. Breakfast in bed, big lattes, cozy sweaters, movies, music, everything you dream about on a sunday.... and of course BRUNCH! 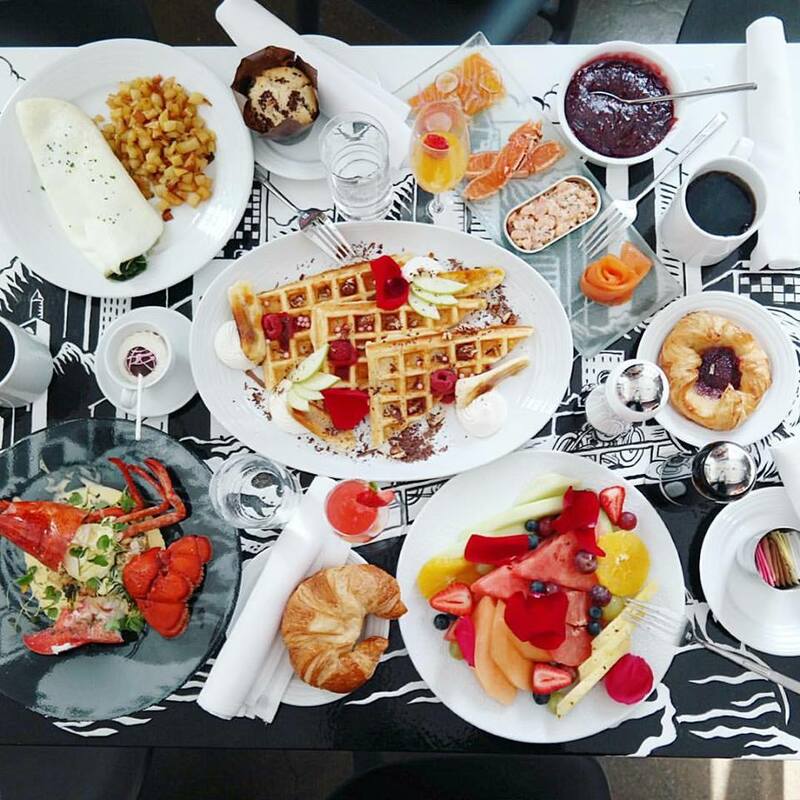 If you are looking for the perfect spot to have brunch this Valentine's day in some of our favourite cities, here are our top three suggestions in Montreal, Toronto, Chicago and New York. Enjoy your time with those you love.. If you're looking for a classy cocktail spot, head over to Midnight Rambler in the Jouel Hotel. This bar was inspired by the New York City cocktail world. They pride on only serving the best in liquor and signature cocktails. The bar is located downstairs below the hotel and if not looking for it isn't really that evident to the eye besides the cute patterned staircase enclosed in class. The vibe is cool and welcomes a mix of local business workers and tourists alike. A new spot that opened in uptown Dallas is a great visit for a Thursday or Friday night in the city. This little space is actually a small house with a porch and a front swing. Inside they have a fireplace and a full cocktail bar where they refer to their bartenders only as "mixologists" rather then bartenders. They specialize in making signature cocktails and I have to say this was one of my favorite moscow mules while traveling in Texas. The fireplace inside is a cute date night spot to sit and have a drink in a dim lit environment. The Belmont Hotel was recently bought and is in the process of being transformed. First and foremost, their old cocktail bar has most recently become a cool place for locals to hang. This area called Oak Cliff is one of the hottest growing neighbourhoods, picking up with trendy little spots to check out. With references to areas like New York's Brooklyn and Montreal's St Henri, this area is one to keep an eye out for as is the trendy bar. You may feel like your in a movie in the 70's in this dim lit environment and remote hotel. The Away Spa: The wonderful Away spa is a great chance to get “away”, regardless of your distance from where you call home. This spa caters to serenity and calmness. With an interior design layout that calms visitors and outstanding unique treatments, like Aromatic Body Touch Wrap and Sacred Nature Exfoliant Ritual, you will be sure to leave relaxed and refreshed. Eat Restaurant: The newly opened restaurant, Eat, at the W Montreal embraces the unique side of Montreal that makes it what it is. One of the strongest impacts of this is shown through local design and art that shares signature Montreal moments and icons, like our maple syrup love and dual vibe from French to English. The WOW Suite: The WOW Suite is one of the suites located on the 10th and top floor of the W Montreal. This suite over looks Victoria Square a popular park square in Old Montreal for locals and tourist a like. This room is two floors, newly renovated with a spectacular shower and caters to outstanding comfort. The room has a lounge area and bathroom on the lower entrance level. The top floor has a loft style bedroom with a large shower and bathroom all overlooking the rest of the suite. The room is floor the ceiling windows, sharing the spectacular view with more than just the giant balcony. Outstanding attention to Furry Guests: The W Montreal caters incredibly well to your furry friend staying the night with you. On the room service menu, they offer dog treats, toys and meals to order for your pouch. They happily welcome them and make sure to bring your pouch bowls and a bed to comfortably stay the night, just as they do with you. You can feel confident and happy bringing your friend along with you, which is a big bonus for the weekend get away crowd, and this we love! In the spirit of my next weekend getaway I am sharing my favourite travel essentials this season. With early flights, jam packed days of meetings and conferences, it's important to have easy transition items when running around town. This trip to Chicago will feature some of my go-tos and a few new discoveries for fall. Nunuco Design Company Passport Holder I am loving these new passport holders from Nunuco Design Company. I shared their phone cases a couple months back, but since then the brand has expanded into awesome lifestyle products like notebooks, agendas and passport holders. Their cute yet stylish hand painted prints translate perfectly to passports, especially this design made for any travel bug. Tilley Felt Hat The heritage brand Tilley has most recently launched new fashion hats. Their collection this season features lots of grey, burgundy and of course black felt. The styles are perfect for travel when we need the extra accessory to throw on and look chic (even for a 6am flight). Check out their new collection online or instores! Everything Birch Box Ever sad that your favourite discovery from BirchBox is only sample size? Think again when it comes to travel, BirchBox goodies are the perfect companion for your luggage. They are not only carry on appropriate, but for those like me who don’t pack lightly, they won’t weigh down a checked baggage either. For a weekend trip, we don’t need more than these sizes, so make sure to pack all your favourite finds from BirchBox this trip and leave some extra room for shopping goodies. Frends Earphones It's no surprise here that these are on my weekend travel essential list. I have had these earphones for a while now and they have always been my go to for traveling. With great sound and exterior noise blocking, they work wonders when there are loud noises on the plane. They also look awesome! The perfect side bag for gallivanting around your destination Let's be honest, once you’ve landed in your destination and dropped of your giant bag at the hotel, you have no interest in lugging anything more than your wallet and cellphone around your destination. Make sure to pack your favourite side bag (that matches with the most of your outfits). This way you can run around hands free as you discover the ins and outs of your end point and anything in between. My go to is my Gucci disco bag. The colour matches with all seasons and pretty much all of my wadrobe. A transition lipstick Packing a lipstick that you love and can wear from day to night is key when traveling. I’m a big fan of Armani lipsticks. The one I am loving right now is a purple/blue that goes on a lot lighter than it seems. It brings out your blue tones (for those with light eyes) and cuts red tones, key for early morning go times. A day to night time piece I fell in love with Minimalist Watches right away. These unisex time pieces are practical, well priced and fashion forward. I love my silver hardwear and brown strap for this season, and on the road you'll be able to stay punctual and stylish! The perfect little lens camera My all time favourite camera, my Samsung NX300M that not only takes incredible pictures, but is also travel size appropriate is a must for any entrepreneur, blogger or just picture enthusiast. A blowout My last but not least must have travel essential is a blowout. This saves you so much time while traveling. I like to get a blowout the the day before if I am traveling early. No need to worry or stress about your hair in the morning and you are good to go for the entire day. Look up great dry bars near where you are staying and you can get a blowout on you trip as well to cut time and ease your schedule! The Toronto sign This sign was made for the pan-am games held over the summer, which was when I had a chance to see it. Post this it will be moving around the city to different locations. ROM Friday Night Live On Friday nights entrance into the ROM (royal Ontario museum) is 5$ for members and 15$ for guests. They feature DJs and set up a bar to hang out at. Jays Game The Blue Jays, Toronto's National baseball team, have been having a great summer. If you can catch a home game while you are there the atmosphere is tons of fun. Food, drinks, hopefully sunshine and some crazy fans! Mascot Brewery If you're looking for a cool rooftop that is very laid back, check this place out. You enter through another club to get to the roof. They then have two levels, bars, rooftop picnic tables and a cool surrounding in the middle of urban Toronto buildings. Wilbur Probably one of the best Mexican places I've been to. You order as many tacos as you want from their assortment, and then you take a visit to the topping bar. Tons to choose from, and they even have a hot sauce bar with more hot sauces than I have ever seen. Top this off with the fact that it's completely adorable inside, it's a must. Only open for lunch though so head over early! El Catrine In the middle of the distillery district, El Catrine is an awesome Mexican spot with crazy drinks and a huge patio. The patio has tons of lounge seating and a fire pit for guests to huddle around. This would be a fun spot with a group looking for an awesome vibe and drinks. Valdez This spot is a restaurant in the heart of Queen West nightlife. They have a cute restaurant-bar on the ground floor, and a great rooftop patio to lounge and have a drink on summer nights. The best part, on the weekends, if you're heading to the bathroom on the lower level, keep walking past the buss boy station and out the emergency door. They have a speakeasy club hidden away in the back. You can't hear or see a thing and it's a totally different vibe. You feel very cache. Biblos A Mediterranean gem, this spot on Duncan takes you to a few different Eastern Med cuisines in one meal. My top recommendation is the warm yogurt topped with different spices, nuts and honey to start. Bar Isabel I have a soft spot for this bar, not only because it's delicious but because the interior felt a bit like home. The little tapas spot with incredible seafood is a must, almost as much as their half octopus plate. Cluny Back to the distillery district, Cluny is a wonderful French bistro. The best part about this spot is their back room with long tables, perfect for a big party. Anything in the distillery is a great visit since you can spend a bit of time walking the cobble stone and snapping some great spots of the historical area. Kasa Moto Kasa Moto is probably my favourite restaurant I discovered on this trip. The Asian fusion, indoor/outdoor location in the heart of Yorkville is an incredible spot. Their food is outstanding and the decor is to snap about. Try the cold noodle salad! Portland Variety Close to the hustle and bustle of downtown this trendy spot has great eats, specialty cocktails and wicked ambiance. Blo blow dry bar I'm a big fan of blow out bars when visiting a city. You save time to explore and can head there first thing in the morning feeling fresh and ready all day. Blo is fast, well priced and easy. You don't need to explain much besides requesting their signature blow out. The Good Press juice bar This was my favourite juice bar I found on my trip. The juices were awesome, but they also have insanely yummy acai bowls topped with different healthy options. Boxcar Social coffee shop This coffee spot has incredible coffee, great vibe and instagram worthy setting. They most recently did a pop up cafe outside of the Club Monaco on Bloor Street. Big hit! Seriously amazing baked goods, mostly fresh breads, croissants, scones, and cinnamon buns. This spot is adorable, delicious and I feel as if I can still imagine the smell lingering in my nose. If you are visiting someone while in the city, this is a great spot to pick up a fresh loaf of anything, because it's all amazing! This coffee spot has great coffee, open space to do some work and nice outdoor seating to watch the strolling friends of the market. Great to grab a coffee in the middle of your hustle and bustle just as you stroll through the streets. I was blown away by Eative. They are a Toronto grown company who makes natural, sugar free, lactose free sorbet from a liquid nitrogen freezing process. I had the pleasure of meeting Damien one of the owners who was planning to purchase the location in full after the company branches out into more franchises. They plan to expand in other locations across the city and eventually the country. Great concept, and I have to say wildly entertaining. Although they did tell me that most people who had my reaction were below the age of ten, I still stand by my hysteric laugh as the liquid nitrogen invaded the colourful mixing bowls to make flavours like passion fruit guava and grapefruit honey! Love the name of this spot of course. You can often find me referring to someone as “a good egg” so I naturally had to check it out. They have awesome gifting items, with a focus on books and stationary. They carry Rifle Paper Co, which of course is a favourite of mine. They also has TONS of amazing cook books which I sadly didn't have space to carry home! They also had fashion books, health books and tons of other great finds. For any popcorn addict like myself, this gem is a haven. They have every kind of popcorn you can possibly imagine. Seriously! Th specialize in flavours like s’more popcorn with marshmallow and chocolate, cinnamon caramel, espresso caramel, dill pickle, jalapeno cheddar and so many more. There is a flavor for everyone. A real treat and bonus, they let you samples everyone and trust me I challenged that! I hope my recommendations at the market help you explore and find what you love! For those of you who follow my social accounts, you probably saw I just spent a long weekend galavanting around Tennessee. Like any good social gal, I looked up tons of cute places to visit, but as always some are a hit and some are a miss. I also always make a point to mingle with locals on my trips. My tip for any adventure; find a few people who would probably be great friends if you were from around town and ask them where to hang out, those will probably be your best tour guides. Of course it's awesome to visit the classics in each spot, like Graceland in Memphis and The Opry in Nashville, but since it's hard to find the hidden gems I figured I would help you out! Here are my top 5 unconventional spots to visit in Memphis and Nashville. 1. The rooftop of the Madison Hotel This rooftop overlooks the Mississippi River and is a perfect spot to watch the sunset. With good music, a nice breeze in the heat and a fire pit in the cooler weather, this spot is a Mississippi heaven. Tip; check out the phone booth art on the way to the hotel featured on Main street. 2. Kings Palace Cafe Courtyard If you are looking for a good local jam (in the heart of touristy Beale Street) this outdoor bar and picnic patio features Memphians jamming to local talented artists. Grab a fishbowl and dance away. Sometimes celebs from the neighborhood even hop on stage. We got to see Johnny Hallyday! 3. Paula & Raiford's Disco Visit this disco spot for a tacky "heart break hotel" dance party. Closing later other bars, Paula & Raiford's is red, sparkly, has a light up dance floor and sells fortys of beer all night long. And on top of all that, spins the best dance tunes. 4. American Dream Safari If you are looking to visit a few key spots in Memphis (and not the typical touristy way), this guy will take you around town in a 55' Cadillac, jam with you and show you local street art. Awesome way to see the city! 5. Stock and Belle This new spot is a bit further down main street and is a design dream. The interior design is all done by the owner Chad. The main floor features a mix of both local designers and outsourced talent. From clothing to furniture, this place has tons of great finds. Bonus; the second floor is a trendy salon where you can get a mean blow out and highlights. Plus the owners girlfriend runs the salon. Adorable. 1. Winners and Losers Everyone knows Broadway has great live music, but if you are looking to get away from the typical tourist scene, check out the bars in Midtown Nashville. Two bars next to each other called Winners and Losers are great spots to spend your night. On Monday nights, Losers has a whiskey jam with young locals and awesome performances. You may even spot a few local celebs. Lucky for us, we headed to midtown for their Cinco de Mayo block party and caught performances on the closed off street by singer/songwriter Will Hoge. 2. Pinewood Social This place is absolutely genius. Known as a place to meet, a hang spot for friends and awesome eats, Pinewood Social has it all and then some. With a coffee spot, cocktail bar, specialty eats, a bowling alley and did I mention a pool lounge with bocce ball and a food truck, this hang is nothing short of perfect. 3. Saint Anejo I may be a little bias since we hit up this spot on Cinco de Mayo (and my favourite food happens to be Mexican) but this restaurant is a booming gem. Garage door walls, half inside and half out, margaritas and tacos to kill, it's a must try in the Gulch (another local area to visit). 4. White's Mercantile This gift shop meets clothing boutique, is actually in a refurbished gas station. In the heart of 12 South district, with tons of awesome finds, there is plenty to explore here. (And a homemade Popsicle spot across the street called Las Paletas. I tried a coconut pop dipped in dark chocolate. Yum.) PS. The goodies in my cover photo are all courtesy of my purchases at White's Mercantile. 5. Crema There are a lot of great coffee shops in Nashville, but Crema stole my heart. With a great brew, avocado toast and original beans, this spot is worth the visit. Tons of cool locals to be found on site. There are so many more places I could touch on but these 5 were worth the mention. With only a few days in each spot, I'm already planning my return. Luckily my family is down in Tennessee a lot so I'll be returning soon and I'll be sure to send through more recommendations! Hope you have a chance to visit!